As a self-renewable resource, it has proven its worth in the conservation of our ecosystem. Wood is either naturally durably or can be artificially preserved for the desired application. It is beautiful, strong, environmentally friendly, CO2 neutral, recyclable and infinitely renewable as long as it comes from sustainably managed forests. Jungle Gym climbing frames and playhouses are made from high quality pine wood from Northern European forests. 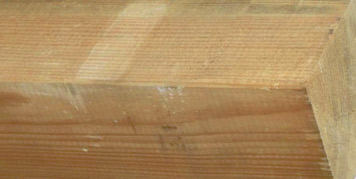 This wood comes from coniferous trees such as Pine, Spruce and Douglas fir. In robust dimensions and with the right specifications, these woods are the ideal building material for a solid and durable climbing frame. Given its good technical properties, natural appearance and durability makes it a first class material for climbing frames, playhouses and swings. 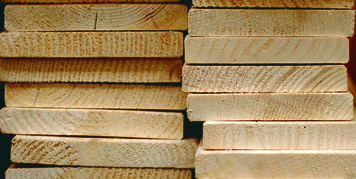 All solid Jungle Gym timberparts are carefully selected, cut to length and smooth planed. The extra sturdy dimensions or our play set posts are unique in relation to the commonly used dimensions within the industry, so we can ensure a solid, robust construction and years of safe play fun. 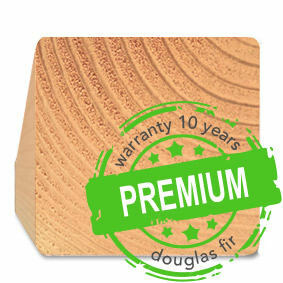 You can choose from impregnated standard Pine or premium Douglas. Both types of wood originate from sustainably managed northern European forests and have been guaranteed to the first owner for 10 years against wood rot. 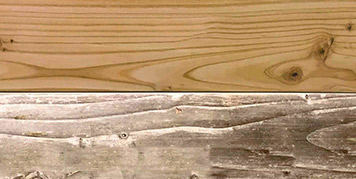 See the table below for a comparison of the two different wood species. The wood for Jungle Gym climbing frames to make the climbing frames and playhouses is either FSC or PEFC certified. These are international non-profit organizations which promotes sustainable forest management through independent third party certifications.This ensures that your Jungle Gym is made of wood from sustainable forests with consideration for people, wildlife and the environment. After all, trees are our most valuable natural source; they generate the oxygen that we breathe, are vital for millions of animal species and protect our climate. All Jungle Gym play equipment is accompanied by a timber pack made out of Douglas or impregnated Pine. These timberparts are resistant to weathering and wood rot. We are convinced of our quality and therefore we guarantee these parts during 10 years against wood rot. Within the warranty period, the affected wooden parts delivered by us will be replaced free of charge under the conditions our assembly instructions are followed, no alterations to our designs have been made and installation is done according to our prescriptions. 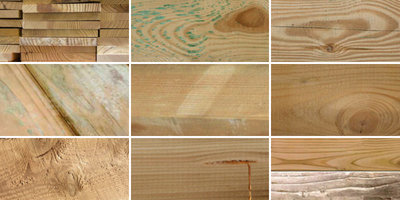 Wood is a natural product and all parts therefore have their own specific characteristics. Every tree, every piece of wood is unique. Natural variations in structure, irregularities and appearance will show up in time. One should think of fading of color, small deviations in dimensions, deformations, knots, resin pockets and cracks. These are related to the wood specie and are authenticity features that give solid wood its natural beauty. These natural properties of wood have no effect on the physical and mechanical integrity of your climbing frame. 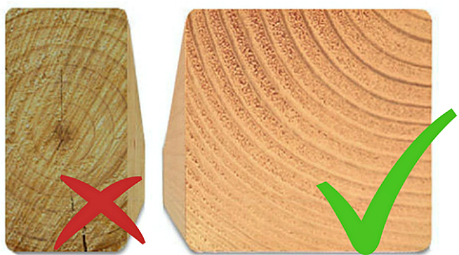 Wood reacts to changes in humidity by changing its volume. In extreme dryness it shrinks, i.e. it reduces its volume. This is a specific characteristic that is unavoidable. Depending on the moisture content of the wood the wood parts can work differently and it can lead to dimensional deviations (up to 10%) and deformations. Tip: To ensure an exact fit, the wooden parts are not pre-drilled. During impregnation, the wood is coloured green by the copper-containing preservative. In places where resin is present in the wood, this becomes extra visible in the form of green spots and the formation of salt crystals. 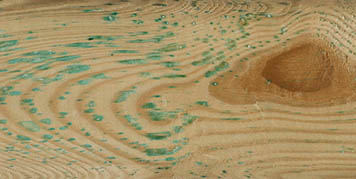 This is common and occurs with all impregnated wood. After being exposed to the sun for a few weeks, these will disappear by themselves. From that moment on it is possible to stain the wood, if desired. Wood is a natural product and in some cases can expand, shrink or even split. Wood reacts to changes in humidity with a change in volume. This inevitably leads to cracks and deformations. This is a specific property of wood that cannot be prevented. These cracks and deformations do not affect the strength and do not form a basis for complaints. 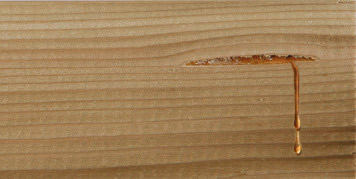 Tip: Cracks with a length of up to ¼ of the wood length and ¼ of the cross-section are not mechanically relevant! Impregnated wood is very moist. 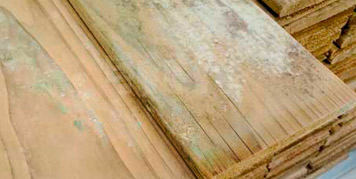 Especially in warmer seasons the wood is susceptible to mildew or mould during drying. This shows itself as white spots on the wood surface. These fungi do not affect the quality or strength of the wood and they are not harmful to health. These external imperfections on the product disappear by themselves, but are also easy to remove manually. Tip: After delivery, remove any protective film to prevent condensation from forming underneath the film, which will cause stains and mould on the wood. 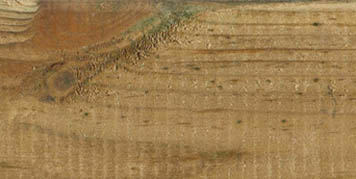 Knots may occur in the selected wood. A knot is a round, oval or irregular form of harder and dark wood at the place where a branch had grown. Knots, annual rings, cracks and small imperfections belong to the natural properties of wood and therefore give it its own specific character. 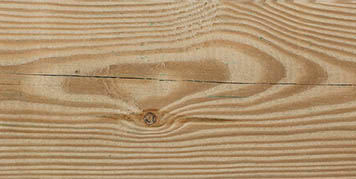 Rough spots and splinters may occur on some wooden parts. Despite careful selection and production, some of these rough spots cannot be avoided. 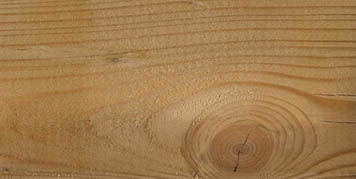 Depending on the type of wood, these rough spots occur mainly around the knots and at the ends. These aesthetic defects form an inseparable part of wood and they do not affect its strength and do not justify complaints. All coniferous species contain resin. Due to the effect of sunlight it is possible that in the first year resin will come out of the fresh wood. The sticky leaked resin can crystallize to the wood surface taking on a yellowish color. These processes are natural and are considered normal. The colour of the wood changes gradually over time as a result of weathering and the effect of UV radiation. Impregnation is a protection against wood rot and not a decorative finish. 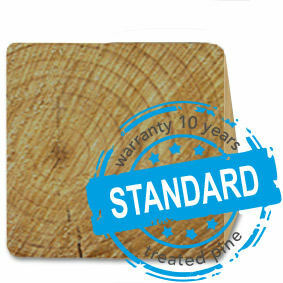 This natural ageing has no effect on durability and does not lead to a loss of wood quality. If you want to preserve the original colour of the wood, you can treat it with a special wood oil or stain / water-based paint / varnish. It does protect wood rot, aging, insects and some cracking.